Experience Nevada’s historic and most profitable former gold and silver mine in via private limo-bus. This is a private, small-group, limousine coach tour of Eldorado Canyon/Techatticup Mine for groups up to 10 passengers. 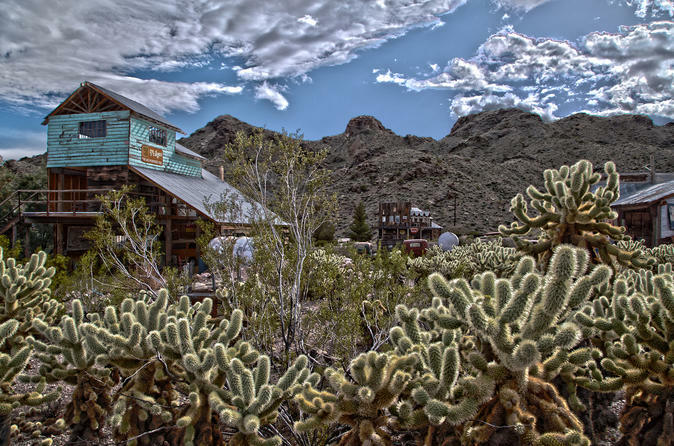 Upon arrival to the "Ghost Town," you will have a guided, NOT private, hard rock mine tour. This tour lasts approximately 1 hour and 10 minutes. After you finish your guided mine tour, you will have time to walk around and explore Eldorado Canyon prior to departing to Las Vegas. You will definitely want to take photographs of this amazing location! Your day starts with hotel pickup at 8am. You'll drive for approximately 45-60 minutes to Eldorado Canyon. Here you will spend approximately 2-hours for the guided mine tour and the self-guided tour of the property. Bottled water will be provided in the limousine and you are more than welcome to bring other beverages/snacks. There are restrooms located in the main building of the Ghost Town. It is highly recommended that you wear shoes that you can walk over uneven terrain above and below ground. You will be dropped back off at your pick-up location just in time to enjoy lunch on the famous Las Vegas Strip!